This research is based on the discovery of a large number of charcoal kiln sites and abandoned iron mines in Vallferrera (Axial Pyrenees, northeastern Spain). The study reveals that this region has been affected by the metal mining and smelting industry for at least 2,000 years, with maximum intensity in the eighteenth and nineteenth centuries, followed by abandonment of the activity. The region’s woodland dendrochronology and historical records indicate that exploitation of wood charcoal for metalworking affected the past vegetation in the area and impeded the development of mature woodland. 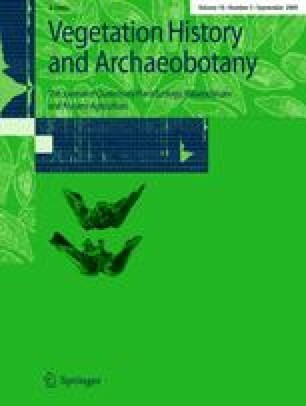 Our findings suggest that the greatest changes in vegetation and landscape history occurred at times of particular specialization in socioeconomic activities. This article has benefited from funding provided by the Catalan government (Generalitat de Catalunya) for the Applied Geography Group (SGR2001-00153) by the Ministry of Education Science (MEC) for the project entitled “Soil use, landscape, and sustainable development in rural mountain areas. Palaeoenvironmental and prospective reconstruction of the landscape” (REN2001-1896/GLO). In addition, Albert Pèlachs was supported by a fellowship from the Generalitat de Catalunya (1999FI 00048 UAB APMARN). Finally, the authors thank Elaine Lilly, Ph.D., of Writer’s First Aid for English translation and language revision.